J.J. Abrams’ Super 8 Scores a Spielbergian Triumph – But What Does “Spielbergian” Mean? On Sunday, my colleague Matt wrote a smashing review of J.J. Abrams’ summer popcorn flick Super 8, in which he detailed the ways by which J.J. Abrams has kept enough information about the film under wraps to effectively squash preconceptions as to what the audience will get from the film. It’s an excellent point, and it certainly holds true to those who caught Super 8 on its opening weekend; for those to follow, however, a certain word-of-mouth will likely help to frame the moviegoing experience to come. – An accessible, “could be anywhere” setting. Super 8’s action is set in the bland everywhere-ness of Lillian, Ohio, which is hinted to be on the outskirts of Dayton in the Midwest US in 1979, which means right off the bat, the story takes place in a town not unlike your own — or, if not your own, not unlike millions and millions of your fellow Americans. A 1979 setting also frees the story from needing to involve cellphones, the internet and other modern conveniences, which pares the plot down to a much more appealing, manageable skeleton. E.T. similarly took place on a neighborhood cul-de-sac in suburban California, which could have stood in for any number of thousands in America in 1982; Gremlins was set in the rural, friendly town of Kingston Falls and Back to the Future took place in the homey, Rockwellian Hill Valley, California. Spielberg’s mastery was always in finding a setting which resonated, and his fan base — arguably mostly kids and families — identified with this. -A precocious, likeable group of kids. Super 8’s team of protagonists are assumed to be between fourteen and fifteen years old and display a distinct array of personalities: the funny one, the bossy one, the smart one, the chicken. It’s an age-old team of hero archetypes for the Spielbergian universe. 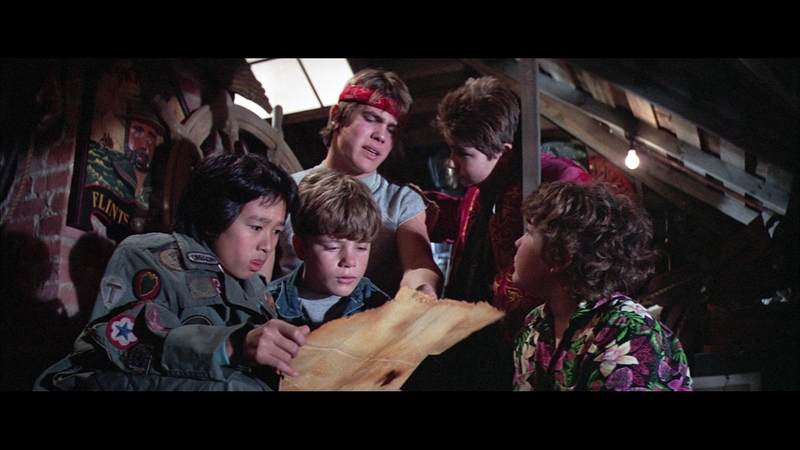 The Goonies similarly had a lovable group of mischievous youth (in fact, it bears noting that Super 8′s young star, Joel Courtney, bears a striking resemblance to a young Goonies-era Sean Astin), and Elliott’s brother, sister and their neighborhood friends ran the gamut of personalities in E.T. By setting up a series of agreeable young leads, Spielberg was always able to not only keep the audience rooting for his stars but to shoot a storyline through the “magic and wonder” lens of a kids’ eye. It’s smart, and it works. -A creature which may be villainous, or may be simply understood. I won’t give any spoilers away for Super 8, but if you’ve seen any trailer and have an acceptable set of comprehension skills, you’re by now well aware it’s some sort of a “monster” movie. We’ve seen Spielberg’s creatures exist on opposite ends of the ethical spectrum over the years, from the friendly flying saucers of *Batteries Not Included to the viciousness of Jurassic Park’s raptors, and the Spielbergian scholar knows that the creature(s) in question’s intentions are always revealed in the final act. E.T. meant no harm, but the War of the Worlds machines most definitely did. Another solid example is The Goonies’ Sloth, a deformed and forgotten sibling who reveals himself to be perhaps the most virtuous character in the tire film. Part of the fun with a Spielbergian picture is finding out what these characters are ultimately up to. -Save the monster for the end. Many believe that Steven Spielberg invented the notion of saving the big reveal of the film’s pivotal creature for back end of a movie, a convention he pioneered in Jaws. Jaws was beautiful in that the threat lie in what was swimming unseeably beneath the water, so when you finally see the beast explode out of the water at a chum-trolling Roy Scheider, it’s all you hoped and imagined it would be — perhaps even bigger and scarier than you imagined. These are the moments in the film where Spielberg’s vivid imagination meets up with your own, as if to compare notes as to what you thought you were going to get at this point in the film, and one gets the idea he’s always trying to meet our expectations (spoiler alert: he usually does and has). -Family or personal connection is important above all. There have been a million movies made about a million monster and alien attacks, with the focus being on the attacks themselves, but the Spielbergian method is to create a sense of emotion among these incidents. Harry and the Hendersons dealt with the family dynamic when a Sasquatch is involved, Poltergeist focused on attempts to keep a family together even as unseen forces threaten to tear it apart, and even Hook, which is considered somewhat of a failure, took the Peter Pan story and made it into the story of a father who had lost the ability to communicate with his family. It should be noted that there’s a very important asterisk to this rule: Close Encounters of the Third Kind saw its hero, Indiana electrician Roy Neary, board a spaceship in the film’s finale and leave his entire family behind on Earth. Otherwise, the Spielbergian conceit is always that family is special. And essential. Given these essential rules for what makes a film Spielbergian, it’s no surprise that Abrams — by following these rules — has found massive success in Super 8. Abrams has made no secret that his thrill for working with Spielberg (who executive produced the movie) took him back to the director’s movies he loved as a kid, and he’s clearly learned the art by observing Spielberg’s work. What results from the pairing is a throwback to a summer movie the likes of which have become lost in a sea of explosions and comic adaptations. It’s not perfect, but it’s just what we need right now. At the end of the day, Super 8 both touches and thrills; and historically, that’s just about as Spielbergian as it gets.